Snooker starlet Jamie Wilson pocketed £80 prize money after triumphing in a London under-16 tournament. The 14-year-old from Havant edged Gosport-based Olly Gibbs 2-1 in the final of the event at Frames Sports Bar, Coulsdon. Wilson trailed the former English Under-14 Champion in the decider before snatching victory on the final black. His World Snooker coach, Tim Dunkley, was delighted that the post-season technique changes were beginning to bear fruit. He said: ‘We started working on some technical improvements straight after the EASB Regional Junior Tour play-off in Walsall four weeks ago. Wilson had topped his four-man round-robin group despite losing one match. He then dispatched Premier Junior Tour player Mickey Joyce (Basingstoke) 2-0 and Jack Haley (Harlow) 2-0 to set up a clash with his 14-year-old travelling companion and practice partner, who collected £40. 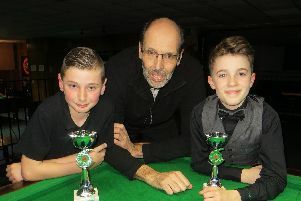 Back at his home club, Waterlooville Sports Bar, Wilson followed up his success by winning the top group in the Monday Junior Snooker League despite conceding a 40-point handicap start to all of his opponents. And his brother Harry all but snuffed out Zak Truscott’s hopes of retaining his title. The 12-year-old beat his second-placed rival to extend his lead to ten points with three weeks remaining. Billy Reid was undefeated in the second group and missed the black off its spot on a run of 18 for his highest break. Owen Jenkins was the only player to take a frame off Wilson in a 2-1 defeat. Lewis Wilson topped the round-robin group in the Junior Pool League. The 12-year-old remains in fourth place as the second half of the 20-week season got underway.